Latest: The APPSC Assistant Motor Vehicle Inspector Admit Card 2019 has been issued. Scroll down to get the link. The recruitment was announced on December 05, 2018, through an advertisement numbered 11/2018 for filling 23 vacancies on the post of Assistant Motor Vehicle Inspector. Now the examination is going to be held in online mode. Get here rest of the details of admit card and examination. Admit Card: Click here to download the APPCS AMVI Admit Card 2019. 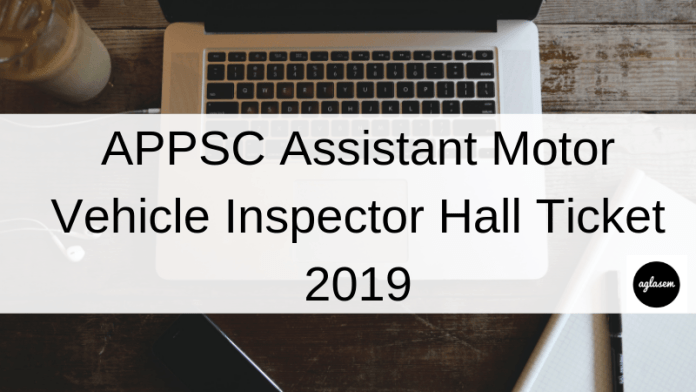 How To Download APPSC Assistant Motor Vehicle Inspector Hall Ticket 2019? As the admit card are available for the online exam, so who have registered themselves can download the admit card from here. Check the steps to do so. Click on the above link, the link redirects to the login page on the website. The landing page asks to enter the user id and password. On entering the details the hall ticket of AMVI 2019 opens on the new tab. Download it and print it on an A4 sheet. How To Deal Discrepancy on APPSC AMVI Hall Ticket 2019? In case a candidate finds any discrepancy in their name, community, date of birth, etc, then the candidate must bring it to the notice of Commission’s officials/Chief Superintendent in the examination center. The necessary corrections will be done. What If Photograph Is not Clear / Small/ absent on APPSC Assistant Motor Vehicle Inspector Hall Ticket 2019? In case, after downloading the admit card, the candidate finds that his /her photograph is missing/ small, or not clear. Then the candidate has to affix a recent photograph on the admit card. The admit card should be attested by a Gazetted Officer. The same photograph should be provided to each paper to Chief Superintendent for affixing the same on the Nominal Rolls/attendance sheet. The selection of the candidates is based on the preliminray and main examination. The Commission has provided the details of prelims exam in the notification. However, the details for the conduct of the main exam has not been provided yet. Let’s check the examination details of APPSC AMVI 2019. Marking scheme: 01 marks will be assigned for the correct answer and 1/3 mark will be deducted for incorrect marks. The candidates who will qualify the preliminary examination will be called for the main exam. But the candidates have to score more than qualifying marks decided by the Commission, to be considered for next round. The minimum qualifying marks are 40% for OC, 35% for BC, and 30% for SC, ST, and PH or as per rules.